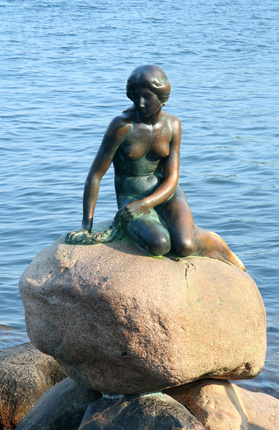 “The Little Mermaid” is number 16 in the Hans Christian Andersen Center’s register of Andersen’s literary works. “The Little Mermaid” was first published 7 April 1837. Now don’t suppose that there are only bare white sands at the bottom of the sea. No indeed! The most marvelous trees and flowers grow down there, with such pliant stalks and leaves that the least stir in the water makes them move about as though they were alive. All sorts of fish, large and small, dart among the branches, just as birds flit through the trees up here. From the deepest spot in the ocean rises the palace of the sea king. Its walls are made of coral and its high pointed windows of the clearest amber, but the roof is made of mussel shells that open and shut with the tide. This is a wonderful sight to see, for every shell holds glistening pearls, any one of which would be the pride of a queen’s crown. Nothing gave the youngest princess such pleasure as to hear about the world of human beings up above them. Her old grandmother had to tell her all she knew about ships and cities, and of people and animals. What seemed nicest of all to her was that up on land the flowers were fragrant, for those at the bottom of the sea had no scent. And she thought it was nice that the woods were green, and that the fish you saw among their branches could sing so loud and sweet that it was delightful to hear them. Her grandmother had to call the little birds “fish,” or the princess would not have known what she was talking about, for she had never seen a bird. Next year one of her sisters would be fifteen, but the others – well, since each was a whole year older than the next the youngest still had five long years to wait until she could rise up from the water and see what our world was like. But each sister promised to tell the others about all that she saw, and what she found most marvelous on her first day. Their grandmother had not told them half enough, and there were so many thing that they longed to know about. The next year, her second sister had permission to rise up to the surface and swim wherever she pleased. She came up just at sunset, and she said that this spectacle was the most marvelous sight she had ever seen. The heavens had a golden glow, and as for the clouds – she could not find words to describe their beauty. Splashed with red and tinted with violet, they sailed over her head. But much faster than the sailing clouds were wild swans in a flock. Like a long white veil trailing above the sea, they flew toward the setting sun. She too swam toward it, but down it went, and all the rose-colored glow faded from the sea and sky. The following year, her third sister ascended, and as she was the boldest of them all she swam up a broad river that flowed into the ocean. She saw gloriously green, vine-colored hills. Palaces and manor houses could be glimpsed through the splendid woods. She heard all the birds sing, and the sun shone so brightly that often she had to dive under the water to cool her burning face. In a small cove she found a whole school of mortal children, paddling about in the water quite naked. She wanted to play with them, but they took fright and ran away. Then along came a little black animal – it was a dog, but she had never seen a dog before. It barked at her so ferociously that she took fright herself, and fled to the open sea. But never could she forget the splendid woods, the green hills, and the nice children who could swim in the water although they didn’t wear fish tails. On many an evening the older sisters would rise to the surface, arm in arm, all five in a row. They had beautiful voices, more charming than those of any mortal beings. When a storm was brewing, and they anticipated a shipwreck, they would swim before the ship and sing most seductively of how beautiful it was at the bottom of the ocean, trying to overcome the prejudice that the sailors had against coming down to them. But people could not understand their song, and mistook it for the voice of the storm. Nor was it for them to see the glories of the deep. When their ship went down they were drowned, and it was as dead men that they reached the sea king’s palace. “Now I’ll have you off my hands,” said her grandmother, the old queen dowager. “Come, let me adorn you like your sisters.” In the little maid’s hair she put a wreath of white lilies, each petal of which was formed from half of a pearl. And the old queen let eight big oysters fasten themselves to the princess’s tail, as a sign of her high rank. “But that hurts!” said the little mermaid. “You must put up with a good deal to keep up appearances,” her grandmother told her. Oh, how gladly she would have shaken off all these decorations, and laid aside the cumbersome wreath! The red flowers in her garden were much more becoming to her, but she didn’t dare to make any changes. “Good-by,” she said, and up she went through the water, as light and as sparkling as a bubble. Now the little mermaid saw that people were in peril, and that she herself must take care to avoid the beams and wreckage tossed about by the sea. One moment it would be black as pitch, and she couldn’t see a thing. Next moment the lightning would flash so brightly that she could distinguish every soul on board. Everyone was looking out for himself as best he could. She watched closely for the young Prince, and when the ship split in two she saw him sink down in the sea. At first she was overjoyed that he would be with her, but then she recalled that human people could not live under the water, and he could only visit her father’s palace as a dead man. No, he should not die! So she swam in among all the floating planks and beams, completely forgetting that they might crush her. She dived through the waves and rode their crests, until at length she reached the young Prince, who was no longer able to swim in that raging sea. His arms and legs were exhausted, his beautiful eyes were closing, and he would have died if the little mermaid had not come to help him. She held his head above water, and let the waves take them wherever the waves went. She saw dry land rise before her in high blue mountains, topped with snow as glistening white as if a flock of swans were resting there. Down by the shore were splendid green woods, and in the foreground stood a church, or perhaps a convent; she didn’t know which, but anyway it was a building. Orange and lemon trees grew in its garden, and tall palm trees grew beside the gateway. Here the sea formed a little harbor, quite calm and very deep. Fine white sand had been washed up below the cliffs. She swam there with the handsome Prince, and stretched him out on the sand, taking special care to pillow his head up high in the warm sunlight. In a little while one of the young girls came upon him. She seemed frightened, but only for a minute; then she called more people. The mermaid watched the Prince regain consciousness, and smile at everyone around him. But he did not smile at her, for he did not even know that she had saved him. She felt very unhappy, and when they led him away to the big building she dived sadly down into the water and returned to her father’s palace. Finally she couldn’t bear it any longer. She told her secret to one of her sisters. Immediately all the other sisters heard about it. No one else knew, except a few more mermaids who told no one – except their most intimate friends. One of these friends knew who the Prince was. She too had seen the birthday celebration on the ship. She knew where he came from and where his kingdom was. “Come, little sister!” said the other princesses. Arm in arm, they rose from the water in a long row, right in front of where they knew the Prince’s palace stood. It was built of pale, glistening, golden stone with great marble staircases, one of which led down to the sea. Magnificent gilt domes rose above the roof, and between the pillars all around the building were marble statues that looked most lifelike. Through the clear glass of the lofty windows one could see into the splendid halls, with their costly silk hangings and tapestries, and walls covered with paintings that were delightful to behold. In the center of the main hall a large fountain played its columns of spray up to the glass-domed roof, through which the sun shone down on the water and upon the lovely plants that grew in the big basin. Increasingly she grew to like human beings, and more and more she longed to live among them. Their world seemed so much wider than her own, for they could skim over the sea in ships, and mount up into the lofty peaks high over the clouds, and their lands stretched out in woods and fields farther than the eye could see. There was so much she wanted to know. Her sisters could not answer all her questions, so she asked her old grandmother, who knew about the “upper world,” which was what she said was the right name for the countries above the sea. This was a much more glorious affair than is ever to be seen on earth. The walls and the ceiling of the great ballroom were made of massive but transparent glass. Many hundreds of huge rose-red and grass-green shells stood on each side in rows, with the blue flames that burned in each shell illuminating the whole room and shining through the walls so clearly that it was quite bright in the sea outside. You could see the countless fish, great and small, swimming toward the glass walls. On some of them the scales gleamed purplish-red, while others were silver and gold. Across the floor of the hall ran a wide stream of water, and upon this the mermaids and mermen danced to their own entrancing songs. Such beautiful voices are not to be heard among the people who live on land. The little mermaid sang more sweetly than anyone else, and everyone applauded her. For a moment her heart was happy, because she knew she had the loveliest voice of all, in the sea or on the land. But her thoughts soon strayed to the world up above. She could not forget the charming Prince, nor her sorrow that she did not have an immortal soul like his. Therefore she stole out of her father’s palace and, while everything there was song and gladness, she sat sadly in her own little garden. The little mermaid set out from her garden toward the whirlpools that raged in front of the witch’s dwelling. She had never gone that way before. No flowers grew there, nor any seaweed. Bare and gray, the sands extended to the whirlpools, where like roaring mill wheels the waters whirled and snatched everything within their reach down to the bottom of the sea. Between these tumultuous whirlpools she had to thread her way to reach the witch’s waters, and then for a long stretch the only trail lay through a hot seething mire, which the witch called her peat marsh. Beyond it her house lay in the middle of a weird forest, where all the trees and shrubs were polyps, half animal and half plant. They looked like hundred-headed snakes growing out of the soil. All their branches were long, slimy arms, with fingers like wriggling worms. They squirmed, joint by joint, from their roots to their outermost tentacles, and whatever they could lay hold of they twined around and never let go. The little mermaid was terrified, and stopped at the edge of the forest. Her heart thumped with fear and she nearly turned back, but then she remembered the Prince and the souls that men have, and she summoned her courage. She bound her long flowing locks closely about her head so that the polyps could not catch hold of them, folded her arms across her breast, and darted through the water like a fish, in among the slimy polyps that stretched out their writhing arms and fingers to seize her. She saw that every one of them held something that it had caught with its hundreds of little tentacles, and to which it clung as with strong hoops of steel. The white bones of men who had perished at sea and sunk to these depths could be seen in the polyps’ arms. Ships’ rudders, and seamen’s chests, and the skeletons of land animals had also fallen into their clutches, but the most ghastly sight of all was a little mermaid whom they had caught and strangled. “I know exactly what you want,” said the sea witch. “It is very foolish of you, but just the same you shall have your way, for it will bring you to grief, my proud princess. You want to get rid of your fish tail and have two props instead, so that you can walk about like a human creature, and have the young Prince fall in love with you, and win him and an immortal soul besides.” At this, the witch gave such a loud cackling laugh that the toad and the snakes were shaken to the ground, where they lay writhing. “Yes,” the little mermaid said in a trembling voice, as she thought of the Prince and of gaining a human soul. “I shall take that risk,” said the little mermaid, but she turned as pale as death. “Go ahead,” said the little mermaid. The witch hung her caldron over the flames, to brew the draught. “Cleanliness is a good thing,” she said, as she tied her snakes in a knot and scoured out the pot with them. Then she pricked herself in the chest and let her black blood splash into the caldron. Steam swirled up from it, in such ghastly shapes that anyone would have been terrified by them. The witch constantly threw new ingredients into the caldron, and it started to boil with a sound like that of a crocodile shedding tears. When the draught was ready at last, it looked as clear as the purest water. “There’s your draught,” said the witch. And she cut off the tongue of the little mermaid, who now was dumb and could neither sing nor talk. “If the polyps should pounce on you when you walk back through my wood,” the witch said, “just spill a drop of this brew upon them and their tentacles will break in a thousand pieces.” But there was no need of that, for the polyps curled up in terror as soon as they saw the bright draught. It glittered in the little mermaid’s hand as if it were a shining star. So she soon traversed the forest, the marsh, and the place of raging whirlpools. She could see her father’s palace. The lights had been snuffed out in the great ballroom, and doubtless everyone in the palace was asleep, but she dared not go near them, now that she was stricken dumb and was leaving her home forever. Her heart felt as if it would break with grief. She tip-toed into the garden, took one flower from each of her sisters’ little plots, blew a thousand kisses toward the palace, and then mounted up through the dark blue sea. The sun had not yet risen when she saw the Prince’s palace. As she climbed his splendid marble staircase, the moon was shining clear. The little mermaid swallowed the bitter, fiery draught, and it was as if a two-edged sword struck through her frail body. She swooned away, and lay there as if she were dead. When the sun rose over the sea she awoke and felt a flash of pain, but directly in front of her stood the handsome young Prince, gazing at her with his coal-black eyes. Lowering her gaze, she saw that her fish tail was gone, and that she had the loveliest pair of white legs any young maid could hope to have. But she was naked, so she clothed herself in her own long hair. He had a page’s suit made for her, so that she could go with him on horseback. They would ride through the sweet scented woods, where the green boughs brushed her shoulders, and where the little birds sang among the fluttering leaves. At home in the Prince’s palace, while the others slept at night, she would go down the broad marble steps to cool her burning feet in the cold sea water, and then she would recall those who lived beneath the sea. One night her sisters came by, arm in arm, singing sadly as they breasted the waves. When she held out her hands toward them, they knew who she was, and told her how unhappy she had made them all. They came to see her every night after that, and once far, far out to sea, she saw her old grandmother, who had not been up to the surface this many a year. With her was the sea king, with his crown upon his head. They stretched out their hands to her, but they did not venture so near the land as her sisters had. “Don’t you love me best of all?” the little mermaid’s eyes seemed to question him, when he took her in his arms and kissed her lovely forehead. Now rumors arose that the Prince was to wed the beautiful daughter of a neighboring King, and that it was for this reason he was having such a superb ship made ready to sail. The rumor ran that the Prince’s real interest in visiting the neighboring kingdom was to see the King’s daughter, and that he was to travel with a lordly retinue. The little mermaid shook her head and smiled, for she knew the Prince’s thoughts far better than anyone else did. “I am forced to make this journey,” he told her. “I must visit the beautiful Princess, for this is my parents’ wish, but they would not have me bring her home as my bride against my own will, and I can never love her. She does not resemble the lovely maiden in the temple, as you do, and if I were to choose a bride, I would sooner choose you, my dear mute foundling with those telling eyes of yours.” And he kissed her on the mouth, fingered her long hair, and laid his head against her heart so that she came to dream of mortal happiness and an immortal soul. “I trust you aren’t afraid of the sea, my silent child ‘ he said, as they went on board the magnificent vessel that was to carry them to the land of the neighboring King. And he told her stories of storms, of ships becalmed, of strange deep-sea fish, and of the wonders that divers have seen. She smiled at such stories, for no one knew about the bottom of the sea as well as she did. In the clear moonlight, when everyone except the man at the helm was asleep, she sat on the side of the ship gazing down through the transparent water, and fancied she could catch glimpses of her father’s palace. On the topmost tower stood her old grandmother, wearing her silver crown and looking up at the keel of the ship through the rushing waves. Then her sisters rose to the surface, looked at her sadly, and wrung their white hands. She smiled and waved, trying to let them know that all went well and that she was happy. But along came the cabin boy, and her sisters dived out of sight so quickly that the boy supposed the flash of white he had seen was merely foam on the sea. Next morning the ship came in to the harbor of the neighboring King’s glorious city. All the church bells chimed, and trumpets were sounded from all the high towers, while the soldiers lined up with flying banners and glittering bayonets. Every day had a new festivity, as one ball or levee followed another, but the Princess was still to appear. They said she was being brought up in some far-away sacred temple, where she was learning every royal virtue. But she came at last. The little mermaid was curious to see how beautiful this Princess was, and she had to grant that a more exquisite figure she had never seen. The Princess’s skin was clear and fair, and behind the long, dark lashes her deep blue eyes were smiling and devoted. All the church bells rang out, and heralds rode through the streets to announce the wedding. Upon every altar sweet-scented oils were burned in costly silver lamps. The priests swung their censers, the bride and the bridegroom joined their hands, and the bishop blessed their marriage. The little mermaid, clothed in silk and cloth of gold, held the bride’s train, but she was deaf to the wedding march and blind to the holy ritual. Her thought turned on her last night upon earth, and on all she had lost in this world. ‘We have given our hair to the witch,” they said, “so that she would send you help, and save you from death tonight. She gave us a knife. Here it is. See the sharp blade! Before the sun rises, you must strike it into the Prince’s heart, and when his warm blood bathes your feet they will grow together and become a fish tail. Then you will be a mermaid again, able to come back to us in the sea, and live out your three hundred years before you die and turn into dead salt sea foam. Make haste! He or you must die before sunrise. Our old grandmother is so grief-stricken that her white hair is falling fast, just as ours did under the witch’s scissors. Kill the Prince and come back to us. Hurry! Hurry! See that red glow in the heavens! In a few minutes the sun will rise and you must die.” So saying, they gave a strange deep sigh and sank beneath the waves. The little mermaid parted the purple curtains of the tent and saw the beautiful bride asleep with her head on the Prince’s breast. The mermaid bent down and kissed his shapely forehead. She looked at the sky, fast reddening for the break of day. She looked at the sharp knife and again turned her eyes toward the Prince, who in his sleep murmured the name of his bride. His thoughts were all for her, and the knife blade trembled in the mermaid’s hand. But then she flung it from her, far out over the waves. Where it fell the waves were red, as if bubbles of blood seethed in the water. With eyes already glazing she looked once more at the Prince, hurled herself over the bulwarks into the sea, and felt her body dissolve in foam. The sun rose up from the waters. Its beams fell, warm and kindly, upon the chill sea foam, and the little mermaid did not feel the hand of death. In the bright sunlight overhead,she saw hundreds of fair ethereal beings. They were so transparent that through them she could see the ship’s white sails and the red clouds in the sky. Their voices were sheer music, but so spirit-like that no human ear could detect the sound, just as no eye on earth could see their forms. Without wings, they floated as light as the air itself. The little mermaid discovered that she was shaped like them, and that she was gradually rising up out of the foam. ‘Who are you, toward whom I rise?” she asked, and her voice sounded like those above her, so spiritual that no music on earth could match it. The little mermaid lifted her clear bright eyes toward God’s sun, and for the first time her eyes were wet with tears. On board the ship all was astir and lively again. She saw the Prince and his fair bride in search of her. Then they gazed sadly into the seething foam, as if they knew she had hurled herself into the waves. Unseen by them, she kissed the bride’s forehead, smiled upon the Prince, and rose up with the other daughters of the air to the rose-red clouds that sailed on high.